WASHINGTON — The former chief executive of XCOR Aerospace told a Senate committee July 18 that the company’s recent financial problems, which led to a layoff of all of its employees last month, could be blamed on a terminated engine development contract. 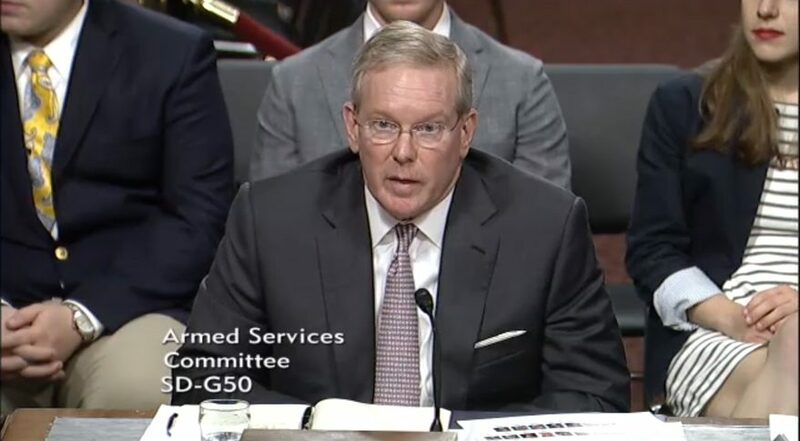 John H. “Jay” Gibson was asked about the financial problems that befell the suborbital vehicle and engine developer during a confirmation hearing for his nomination announced June 16 to become the Deputy Chief Management Officer of the Department of Defense. Gibson, who stepped down as chief executive of XCOR in late June after more than two years at the company, said the company was a subcontractor to another, unnamed company on an engine project when the company was told that contract was terminated on only 30 days’ notice. Gibson didn’t name to whom XCOR was a subcontractor, but in May 2016, when the company laid off about half its workforce, it said it was suspending work on a suborbital spaceplane called Lynx to focus its resources on a liquid-oxygen, liquid-hydrogen engine program backed by United Launch Alliance. That engine was being considered by ULA as one option for a new upper stage for its Vulcan vehicle. That terminated contract triggered XCOR’s current problems. The company’s acting chief executive, Michael Blum, said in a July 5 statement that “adverse financial conditions” forced the company to terminate its remaining employees at the end of June, although some “critical” workers would be kept on as contractors. XCOR management, Blum said in that statement, “is actively seeking other options that would allow it to resume full employment and activity,” but provided no additional details.